← Nations (States) MUST print their own money!! (g) contains specific plans to ensure that all prevention programs outside the Department of Health and Human Services are based on the science-based guidelines developed by the Centers for Disease Control and Prevention under subsection (d) of this section. This is more government Of the corporation, By the corporation and For the Corporation. And as long as the lobbyists and lawyers are in charge of Washington it isn’t going to stop. Now the corporate parasites are feeding on health care in this country – big time! Only these efforts are not about making the population healthy, it is about profiteering from both illness and ‘preventative’ measures. These new health care programs are very much tied into BigPharma (which includes vaccines). This documentary explains A LOT about the dangerous obscenity the pharmaceutical industry has become. There is a lot of drug money to made from a sick population. The documentary also explains how government ‘health agencies’ were co-opted by the drug industry. Apparently decisions made during the Reagan Administration opened the door for drug companies to do their own studies. Basically the fox was put in charge of the hen-house. It looks like the ‘gov’ is well on its way to mandating vaccines for ALL age groups. Let’s not forget that when the leadership of the CDC is corrupt and in a position to set policies . . . all of those policies (for hospitals, physicians and public health workers) are a reflection of that corruption. Therefore, our public health system does not warrant our trust or respect. 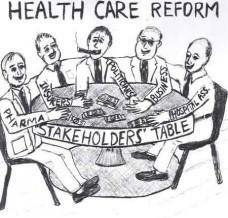 Our public health folks have been turned into facilitators and/or salesmen for BigPharma. Below is an amazing video of testimony provided to the New York state legislators by an independent (not corporate nor government funded) research team. Researcher and patient advocate, Gary Null, expresses his outrage at the harm that is being caused by BigPharma while government agencies look the other way. Many, including myself, are concerned that taking vaccines will be required of everyone to qualify for government health care. Well, there is going to be a huge battle when a growing number of folks simply say no to vaccines. This entry was posted in corporation, corruption, Government, Medicine and tagged corruption, government health care, preventative medicine, vaccines. Bookmark the permalink.